Tailings and Mine Waste '10 contains the contributions from the 14th annual Tailings and Mine Waste Conference, held by Colorado State University of Fort Collins, Colorado in conjunction with the University of Alberta and the University of British Columbia. The purpose of this series of conferences is to provide a forum for discussion and establishment of dialogue among all people in the mining industry and environmental community regarding tailings and mine waste. 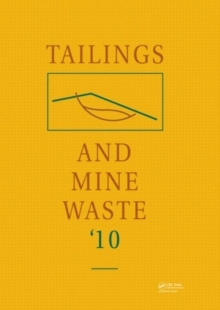 Tailings and Mine Waste '10 includes over 40 papers which present state-of-the-art papers on mine and mill tailings and mine waste, as well as current and future issues facing the mining and environmental communities, including technical capabilities and developments, regulations, and environmental concerns. The book will be of interest to mine and mill managers, engineers involved with tailings management and reclamation, geotechnical and geoenvironmental engineers, regulatory personnel, consulting engineers, and researchers.